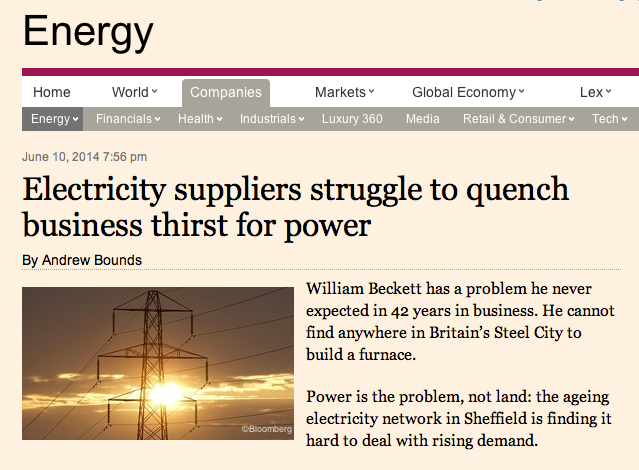 The Financial Times (FT) recently published an interesting story about how electricity suppliers in the UK “struggle to quench business thirst for power”. This article in the FT is an excellent reminder about how important and valuable it is to have access to reliable on-demand power whenever necessary. Here, we will explain how the flexibility of the Icelandic water reservoirs can be utilized as a source for peak load electricity demand in Europe, and at the same time substantially increase revenues and profits in the Icelandic energy sector. 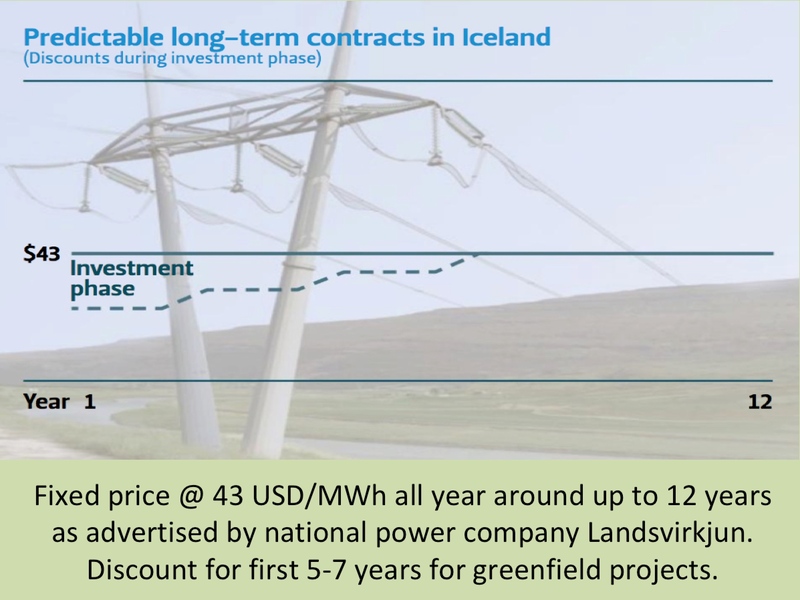 Such a value creation could be a great business opportunity for the steerable Icelandic hydropower. In most European countries demand for electricity can fluctuate significantly between day and night. The electricity consumption within the day can also fluctuate – sometimes with a very short notice. As an example, electricity consumption can change suddenly at commercial brakes within popular television broadcasting shows – when tens of thousands of families suddenly put the kettle on and/or the microwave. 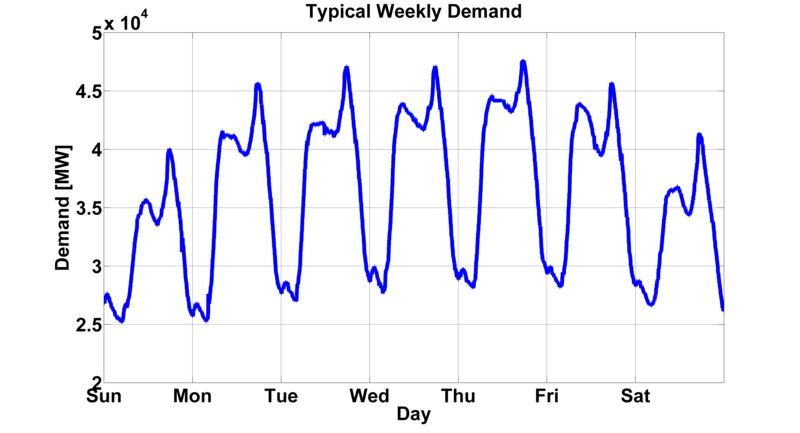 Such fluctuations in electricity demand are often unforeseen. That’s why most European nations need to have good access to energy sources that offer highly flexible and controllable production. But not all energy sources offer good possibilities to increase or decrease electricity-production rapidly. It is actually only natural gas-fired stations and hydropower stations with reservoirs that are flexible enough to fulfill the need of stability in the electricity system. Yes – It is a well known fact that when demand for electricity changes significantly and abruptly, it is natural gas fried power plants and hydroelectric power plants (with reservoirs) that have the best capabilities to meet such changes. This both applies to the need of increased or decreased production. Response time of coal power plants is much slower. And nuclear power stations offer base load power and must be run at close to full output all of the time (therefore storage capacity is needed for excess power generated by nuclear plants at times of low demand). Wind power and solar power plants are almost useless in the regard of flexibility. Because they are subject to the present natural forces (the wind and the sun). In fact, increased use of wind and solar energy in Europe has made it even more difficult to control the balance in the electricity system. Hence, the need for flexible and controllable power production has become ever greater as the use of wind and solar energy increases. Because of the flexibility of hydropower- and natural gas plants – these are the best energy sources to take advantage of price volatility on the power market. The water reservoirs make it possible to manage the production very accurately – and thereby increase or decrease the electricity production with very short notice in line with changes in the electricity demand. Thus, hydropower plants have excellent possibilities to maximize their revenues and profits with regard to price fluctuations in the electricity market. This feature makes hydropower quite unique and makes it the energy source that can deliver the highest return on investment. Moreover, hydropower has the advantage over natural gas being a renewable source of energy. Thus, hydropower can be described as the jewel in the electricity sector – at least if the hydropower station has access to a traditional power market where the demand for electricity fluctuates substantially. To have a better access to flexible electricity, there are examples of water being pumped up to reservoirs (pumped storage). This same water is utilized for electricity production later, when demand is high. Pumped storage also serves as important factor in load balancing. This kind of electricity production is e.g. well known in Austria and Switzerland, as well as in the United Kingdom. Obviously substantial amount of energy is needed for the pumping. But as the pumping primarily takes place during night (when electricity demand is minimum and electricity prices are low) and the water from the upper reservoir is used for electricity production when the demand is high (and prices also), this is a viable option. Pumped storage is a good example of how hydropower with water reservoirs offers the best opportunity to be in the role of flexible electricity supply. However, possibilities for pumped storage are limited. Thus, large electricity markets can gain tremendously from being connected to even faraway hydropower sources – like if the UK had a connector to Iceland. This is also an interesting option for Iceland. Areas that enjoy substantial opportunities for developing hydropower stations beyond their local market need can take advantage of sudden price changes on fluctuating electricity markets. It is precisely such given flexibility with water reservoirs, that has greatly increased the value of the Norwegian hydropower. The worlds’ longest subsea electric cable today is the NorNed cable between Norway and the Netherlands. And now a cable between Norway and the UK is being planned and also another cable between Norway and continental Europe. All this is an indicative of how profitable it is for countries with steerable hydropower to have access to electricity markets where electricity demand fluctuates substantially. In this context electricity from hydropower can be described as the most prestigious product in the energy market. Overseas Iceland is quite well known for its geothermal energy. However, geothermal is the source for only 25 per cent of Iceland’s electricity production. It is hydropower that is Iceland’s most important energy source. The country’s mountainous areas and high precipitation create perfect conditions for utilizing hydropower. Large and small reservoirs are like natural energy batteries, where Icelandic electricity firms can “store” the energy to the exact period it is most needed and sold at the highest prices. 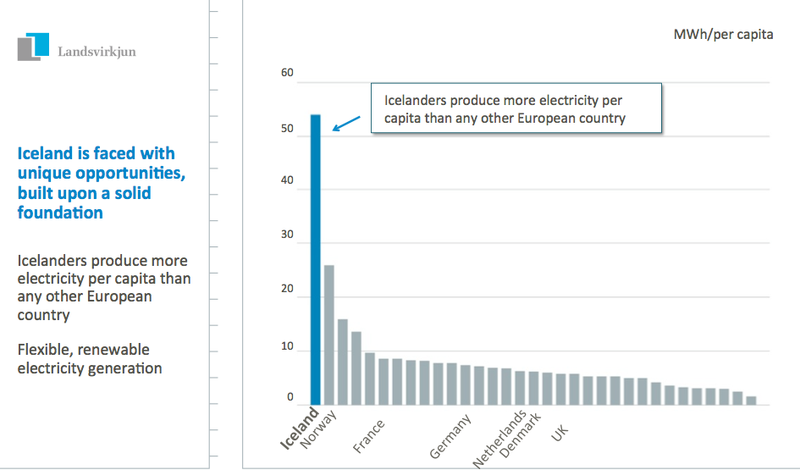 Iceland is the largest hydroelectric producer in the world per capita (Norway comes in second place). But Iceland has not yet taken advantage of the flexibility of its hydropower. In most other European countries the reservoirs would normally be in the role of highly profitable flexible energy sources. In Iceland, however, the main role of the reservoirs has been to serve as energy reserves available for aluminum smelters, which require access to cheap and highly reliable energy source. Moreover, the isolated and closed Icelandic electricity market sometimes results in water flowing from full reservoirs by spillway and into sea without creating any value. Such waste of hydropower is like throwing away the most luxurious goods in the energy market. If Iceland had access to a more normal electricity market (the aluminum industry uses about 75% of all electricity generated in Iceland) it could present Iceland with an unparalleled business opportunity. At the same time, the overseas market linked with Iceland by an interconnector would have substantially increased access to highly reliable flexible renewable energy source. This can truly been described as a win-win situation. Subsea electric cables are steadily becoming longer and going through more depths. A cable between Iceland and Europe (UK) would probably be close to 1,200 m in length and the greatest depth would be close to 1,000 m. Today the longest cable of this kind is close to 600 km and it is likely we will soon see cables extending 700-800 km (a cable between Norway and the UK may become the next record length). And there are already examples of such subsea cables where the sea is more than 1,600 m deep. It seems becoming both technically and financially possible to have an interconnector between Iceland and Europe and at modest cost. The advantages are obvious; both for Iceland and the European country at the other end of the cable. Due to the distance, the UK seems to be the best option. 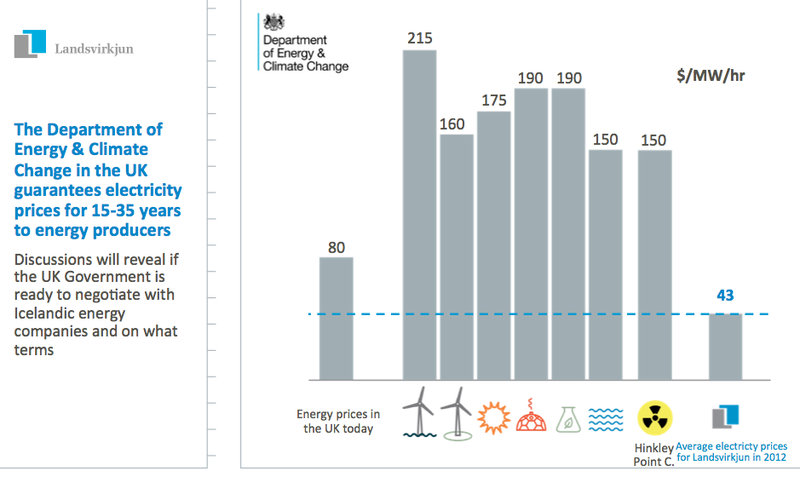 And actually the energy policy of the UK is also very positive for such a project. Thus, an interconnector between Iceland and the UK may be within reach. In the earlier mentioned article in the FT, it is described how manufacturing companies in the UK are finding it hard to access electricity for their production: “[A]ccording to research by Edison Group, a consultancy, one in four UK midsized companies are planning for power shortages over the next few winters.” This situation is obviously very worrying for the UK and calls for immediate measures to ensure future access to more (stored) power. Britain’s supply of electricity is dangerously close to resurgent demand. The safety margin of capacity has been shrinking and now stands well below the 20 per cent necessary to insure against shocks. When demand rises in winter there is a risk that the margin will disappear altogether. To avert this grim possibility, Britain’s National Grid has just announced measures intended to stave off the risk of looming winter blackouts. The regulated utility plans to pay large users of power to be cut off should demand risk outpacing supply. It also intends to recommission about a dozen mothballed gas-fired power plants to establish a capacity reserve. […] The immediate need is to keep the lights burning. National Grid should do whatever it takes to achieve this until new capacity can be commissioned. This will mean higher bills. But house insurance is never cheap when smoke is pouring from one’s windows. 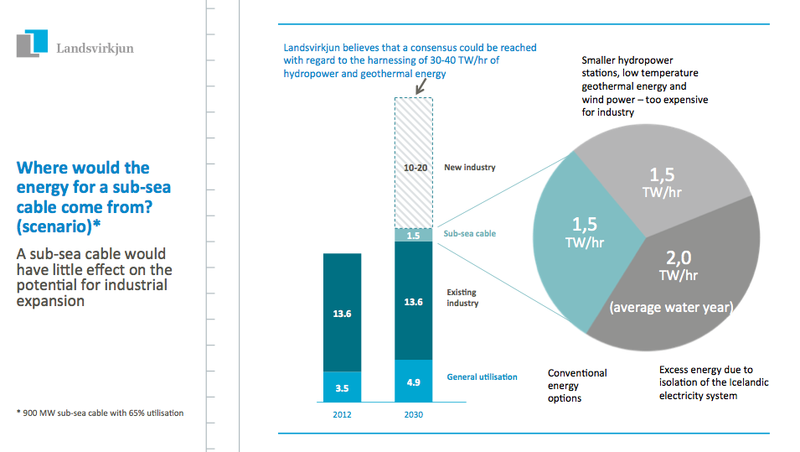 NB: The three slides above from Landsvirkjun (the Icelandic state owned energy company) are from a presentation given by the company’s management in late 2013. The presentation is accessible on the company’s website.